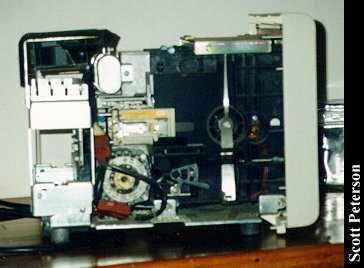 This is an IBM Displaywriter, circa mid-1983, although the boot disk is dated 1982. It is a dedicated word processor built around the Intel 8086 chip, but using boot disks to load the programs. Most dedicated word processors I've seen have had the software loaded in ROM. So far I haven't been able to dig up very much history on it, but even by the standards of the early 80's it was an obsolete computer. 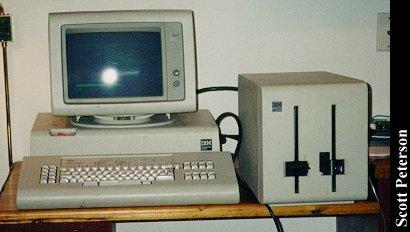 The monitor seems a standard IBM monochrome with a different mount, and is about the only thing that it shares with other computers of the era. The keyboard (which is 2½ inches thick!) has some things in common with the keyboard of the Selectric typewriter, even having a shift lock that actually locks down. The real interest of the machine, however, is the floppy drives, the huge cabinet to the right. These are 8-inch floppy drives, which this machine was the most well known for using. I believe they are 250K each, and according to one source these drives were developed as early as 1971. I'm completely mystified why IBM went through the trouble of making a machine as complicated as this just for word processing, and especially giving it these 8-inch floppy drives. 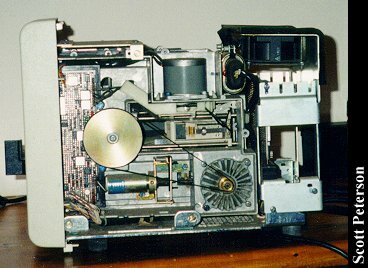 The earliest models may not have had much option, but the 360K 5¼" floppy was already well developed when this one was built in 1983, and would have made it compatible to some degree with other IBM's. 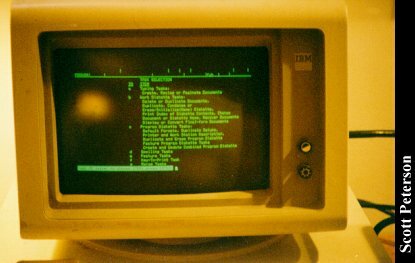 A few people have said that one reason IBM developed the XT and AT around the 8086 chip, with its given limitations, was because they already had the license to use it for this machine. I got this particular one for $15 from a fellow that had fallen on hard times and had been lugging it around with most of the family belongings in the back of a station wagon, and the pictures don't show how filthy it is. 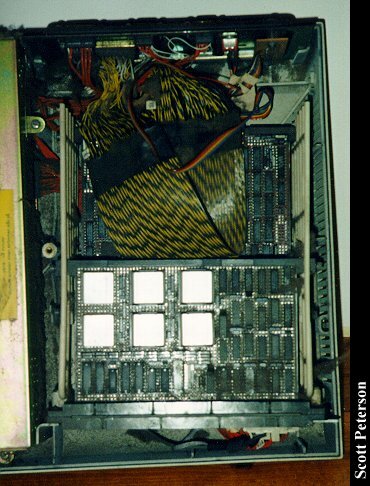 (It will get a thorough cleaning; I just thought it would be interesting to show how a computer can still function even covered in dust.) I only have the master boot disk (there were about five disks altogether.) and when I locate the others I'll see what the Displaywriter can still do. I'm tempted to find someway to make an 8-inch DOS boot disk and see if DOS would even be recognized, but I doubt it would work. Inside the main case. Notice the power supply takes up half the space. It has the simplest takedown of any computer I've known, just lift off the monitor and remove one screw to get it apart. Close up of the unconventional board layout. The "ribbon cable" above is actually a few dozen wires affixed to a plastic strip. Size comparison of a 250K 8-inch floppy, 360K and 1.2Mb 5¼" floppy, and the familiar 1.44Mb 3½" floppy. Click here to view all comments for the IBM Displaywriter and to leave your own. 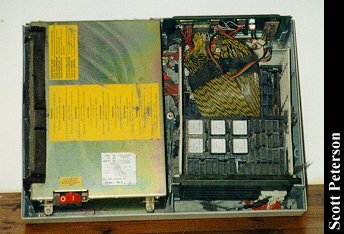 Click here to view comments about other IBM computers.